Modern with an elegant style, this coffee table has glass, wood and metal elements for a unique look. A rich wood grain is below the UV-bonded tempered glass with a rectangle cut out in the middle. 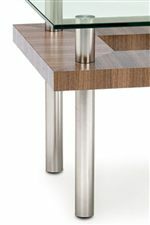 Four stainless steel legs run through the wood piece and provide stability for this piece. Finished in Espresso on Oak for a look that is simple and stylish for your home. The Hokkaido Wood and Glass Coffee Table with Metal Legs by BDI at Jordan's Home Furnishings in the New Minas, Halifax, and Canning, Nova Scotia area. Product availability may vary. Contact us for the most current availability on this product. Finish & Paint Options Espresso, Chocolate and Natural Walnut finishes available. Case Detail Stainless steel circular legs. Description: Top UV-bonded tempered glass table tops. Contemporary and sleek, use this occasional tables to effortlessly update your living space. 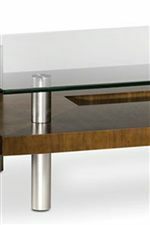 A unique combination of glass top, stainless steel legs and a wood middle shelf. The UV-bonded tempered glass top is strong enough to hold things while still providing a clean look. The wood center part have a cut out for a look that is unlike any other pieces in your home. Use this occasional tables with contemporary living furniture to create a space that is stylish and functional. The Hokkaido collection is a great option if you are looking for Contemporary furniture in the New Minas, Halifax, and Canning, Nova Scotia area. Browse other items in the Hokkaido collection from Jordan's Home Furnishings in the New Minas, Halifax, and Canning, Nova Scotia area.